Proper ditching techniques are a key component to any project that requires surface water transport. The technique chosen is usually based on the anticipated volume and velocity of water to be transported. Ditch design is likely to fall into one of two main categories; either vegetative or structural. Vegetative or grassed waterways can be a natural or man-made channel. The ditch can be either parabolic or trapezoidal in design, is lower than the adjacent land and is often stabilized by suitable vegetation. The flow channel is normally wide and shallow allowing runoff down to migrate down slope. This structure is not considered complete without a properly stabilized outlet. Outlets are the first component of a ditch that need to be constructed as they must be designed and installed to handle the volume and velocity in the ditch. A structural or more permanent waterway (or outlet) is typically lined with concrete, stone or another permanent material. This material usually extends up the sides to the designed depth. 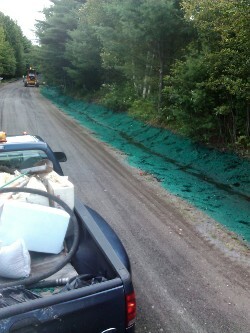 Vegetation established above the permanent lining should be maintained in good condition to prevent scouring if the hard surface is overtopped. Structural lined channels are designed to accommodate the velocities achieved from flooding and concentrated flows that grassed waterways can not tolerate. The design procedures for parabolic and trapezoidal channels are available in the New York Standards and Specifications for Erosion and Sediment Control book; also know as the �Blue book� which can be found online . Another good reference for design and application is the Natural Resource Conservation Service (NRCS) Engineering Field Handbook that can be found here. Please connect CWICNY or your local Soil and Water Conservation District if you have any questions.